An oral surgeon is about to make an incision when the word “contaminated” appears in bright red letters across her gloves, which inadvertently have picked up harmful bacteria. What does it take to deliver that warning? Nothing more than a little silk and an inkjet printer. Pioneering work by a team of Tufts researchers led by Fiorenzo Omenetto, the Frank C. Doble Professor of Engineering, has led to the development of “conformal” biosensors—silk-based inks containing any number of compounds and applied with an ordinary inkjet printer on multiple surfaces. 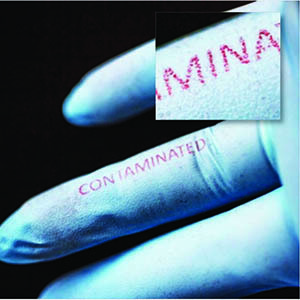 Such sensors could, for example, detect harmful bacteria on surgical gloves or other surfaces in the dental operatory. The research, published in the journal Advanced Materials in June, may be significant in medicine and other fields. The potential applications are limited only by the imagination, says Omenetto, the associate dean for research at Tufts School of Engineering. In their paper, the researchers describe the development of customized silk-based inks containing molecules that change color in the presence of the bacterium E. coli, proteins that stimulate tissue growth and gold nanoparticles that heat on demand or function as optical sensors, among other uses. The research was supported by the Office of Naval Research and the Air Force Office of Scientific Research. Stable, chemically neutral and nontoxic, purified silk protein—or fibroin—achieves the perfect viscosity for use in an inkjet printer when the material is dissolved in water. It’s also biocompatible, meaning it doesn’t trigger an immune response when introduced into the body. This happy accident of nature is one reason why David Kaplan, the Stern Family Professor of Engineering and chair of the Department of Biomedical Engineering at Tufts, one of the paper’s coauthors, has been studying silk’s potential as a biomedical/bioengineering material for the past 15 years. In addition to the germ-detecting surgical gloves, Omenetto imagines one day taking a digital photo of a complex wound—maybe a battlefield injury—and sending that snapshot to an inkjet printer. The result might be a custom bandage that could be impregnated with antibiotics and tissue growth factors—compounds that encourage healing by stimulating skin, muscle and/or bone growth. Such a bandage could distribute the medicine to precisely targeted areas of the wound. These ideas first percolated in Omenetto’s lab around 2007, he recalls, as the team was working on a drug-delivery project. The researchers added an optical element to silk film that reflected light differently under different conditions. In their early experiments, the team used it to detect the amount of oxygen present in a sample of blood. Omenetto and his colleagues soon came up with the idea of a silk film embedded with sensors that warn of the presence of harmful bacteria. Because silk is extremely stable, easy to work with and nontoxic to people and the environment, Omenetto sees it as a potential green replacement for plastics and other inorganic compounds used in high-tech fields. Harnessing silk’s versatility, he says, could mean decreasing industry’s carbon footprint and toxic-waste output without sacrificing technological performance. Jacqueline Mitchell can be reached at jacqueline.mitchell@tufts.edu.